Abilitations Just S Articulate Game helps your students practice target sounds in the initial, medial and final positions in nouns, verbs and adjectives at the word, sentence, phase and carryover level. Game includes 95 cards, 1 dry erase marker and an eraser tip. All cards are dry erase for easy marking on the circles provided on each card or for tallying correct responses while making therapy fun for your kids. Game includes 90 target sound cards that can elicit thousands of responses through a variety of combinations of cards. Abilitations Reach for The Stars Articulation Game Card Set is an ideal school-age tool for warm-up, carry-over and therapy sessions. Objective of the game is to collect as many pairs as possible by asking other players for a desired card, each target word is similar to another decoy word in the deck except for the key R and L phoneme. 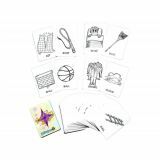 Set with initial, medial, final and postvocalic R includes 3-1/2 in x 2-1/2 in picture card pairs featuring items containing R as well as L speech sounds. This simple, yet popular game is a powerful therapy tool to elicit correct speech productions for R and L which are some of the most difficult sounds. Set offers multiple attempts at target speech sounds, while facilitating more accurate auditory discrimination and self-monitoring skills for increased generalization outside the therapy setting. 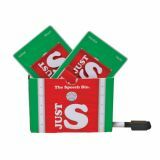 Abilitations Speech Bin Just L Blends Articulation Card Set helps your students practice target sounds in the initial, medial or final positions in nouns, verbs and adjectives at the word, phrase, sentence as well as carryover level. Set offers 90 target sound cards, allowing you to bring out thousands of responses through a variety of combinations. Set renders opportunity to incorporate articles, adjectives, pronouns and modals to form phrases as well as sentences with extra cards. Set features dry erase cards to facilitate easy marking on the circles provided on each card or tallying correct responses, while making therapy fun for your kids. Set includes 95 cards, 1 dry erase marker and eraser tip. 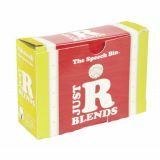 Abilitations Speech Bin Just R Blends Articulation Card Set helps your students practice target sounds in the initial, medial or final positions in nouns, verbs and adjectives at the word, phrase, sentence as well as carryover level. Set offers 90 target sound cards, allowing you to bring out thousands of responses through a variety of combinations. Set renders opportunity to incorporate articles, adjectives, pronouns and modals to form phrases as well as sentences with extra cards. Set features dry erase cards to facilitate easy marking on the circles provided on each card or tallying correct responses, while making therapy fun for your kids. Set includes 95 cards, 1 dry erase marker and eraser tip. Abilitations Speech Bin Just Z Articulation Card Set helps your students practice target sounds in the initial, medial or final positions in nouns, verbs and adjectives at the word, phrase, sentence as well as carryover level. Set offers 90 target sound cards, allowing you to bring out thousands of responses through a variety of combinations. Set renders opportunity to incorporate articles, adjectives, pronouns and modals to form phrases as well as sentences with extra cards. Set features dry erase cards to facilitate easy marking on the circles provided on each card or tallying correct responses, while making therapy fun for your kids. Set includes 95 cards, 1 dry erase marker and eraser tip.